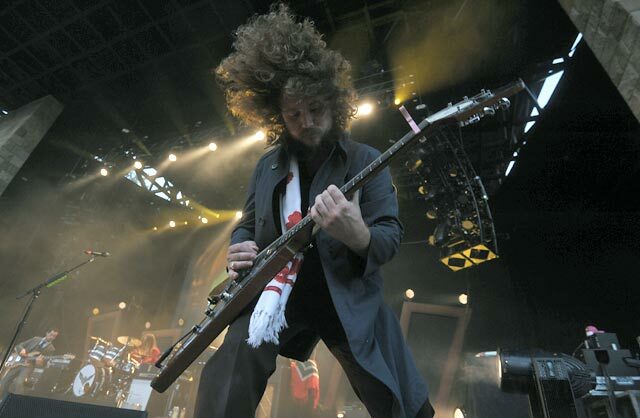 My Morning Jacket's Jim James brought the rock (and an epic head of hair) to the band's lengthy Saturday-night set at the Santa Barbara Bowl. It seemed all too fitting that My Morning Jacket (MMJ) kicked off its Saturday-night set with “Victory Dance,” the lead track off the band’s recently released sixth studio album. Like its recorded counterpart, the song live speaks directly to the band’s current state: jovial, celebratory, and humbly confident in their ability to bring the rock. Sans opener, this past weekend’s show stretched on for more than two hours, included more than 20 songs, and was punctuated by an abundance of solos, jams, and guitar-heavy improvisation. But, more importantly, it never felt forced, or gratuitous, or even showy. Led by frontman Jim James, the five-piece spent its time onstage meandering between the new (“First Light,” “Outta My System”) and the old (“Dancefloors,” “The Way that He Sings”), providing ample samplings from nearly every disc in their catalogue along the way. In turn, fans were rewarded with a night that came close to MMJ’s revered festival sets: famously lengthy, though never cloyingly nostalgic. Sonically, Saturday’s show succeeded in showcasing the many sides of MMJ’s multi-genred repertoire. “Golden” was the quintessential folkie tune, aided beautifully by guitarist Carl Broemel’s slide and drummer Patrick Hallahan’s slow, brushed turns at the kit. Elsewhere, “The Way that He Sings” paid homage to ’80s arena-rock greats, while “I’m Amazed” was awash in big harmonies and Southern-rock grandeur. “Dondante” was a mix of jazzy drum work, bluesy guitars, and psychedelia, which built and then receded to stunning effect. And the new single “Holdin’ On to Black Metal” provided the set’s ultimate twist, mixing James’s high “whoops” and “oohs” with a swirling layer of keys and three-part vocal harmonies. Still, even the epic scope of Saturday’s set took a backseat to James, who spent the night stretching and twisting his voice to registers and tones that were as divergent as they were impressive. Throughout MMJ’s career, the band has struggled to capture James’s abilities as a singer on record, and it’s no wonder. Live, his ability to jump between casual speak-sing, sultry growl, and full-blown Freddie Mercury-esque howling appears effortless and fitting against the band’s wall of deft guitar noodling and no-holds-barred drumming. Stalking the stage, air kicking, and jumping, James can look an unlikely rock star, yet somehow he’s never anything less than genuine in the process. Most importantly, though (and for reasons I still have yet to figure out), he saves the best for last. On Saturday, that meant closing out the night with the high-register heavy punch of “Highly Suspicious” and “One Big Holiday,” both of which place James’s most feminine vocal leaps front and center, making for one of the biggest—and most impressive—finales the Bowl has seen this season, and proof positive that MMJ remains one of the best live shows out there today.